Since 2004, the Swiss Gemmological Institute – SSEF checks the authentication and the quality of colourless small diamonds (melee) batches for many luxury watchmaking and jewellery manufacturers in Switzerland abroad. ASDI – Automated Spectral Diamond Inspection is a highly specialised instrument developed by SSEF that enables the screening of melees at a high speed and reasonable price. Pricing calculator (Excel) for ASDI authentication testing in English and French. 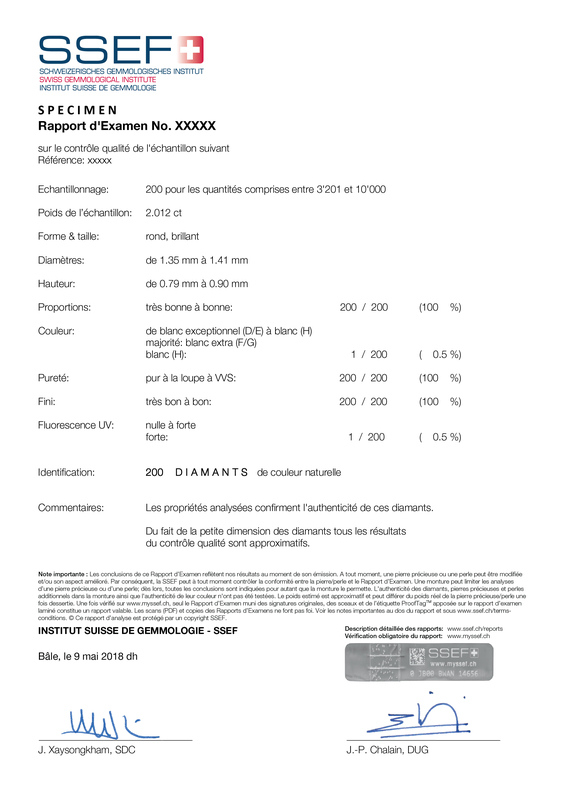 Order Form (PDF) for small diamond testing (needs to be submitted with stones upon shipment). Pricing and principles for authentication of melees and baguettes can be downloaded in French (PDF) or English (PDF). The Swiss Gemmological Institute SSEF has set up a strict protocol for the quality control of colourless small diamonds (melees and baguettes), fitting with specific requirements of the watch- and jewellery industry. The detailed information available on SSEF reports help our clients to evaluate the quality of their lots of small diamonds and maintain their quality management. Our routine ensures the best reproducibility of results and provides our clients results they can trust. Order Form (PDF) for small diamond testing (needs to be submitted with stones upon shipment). 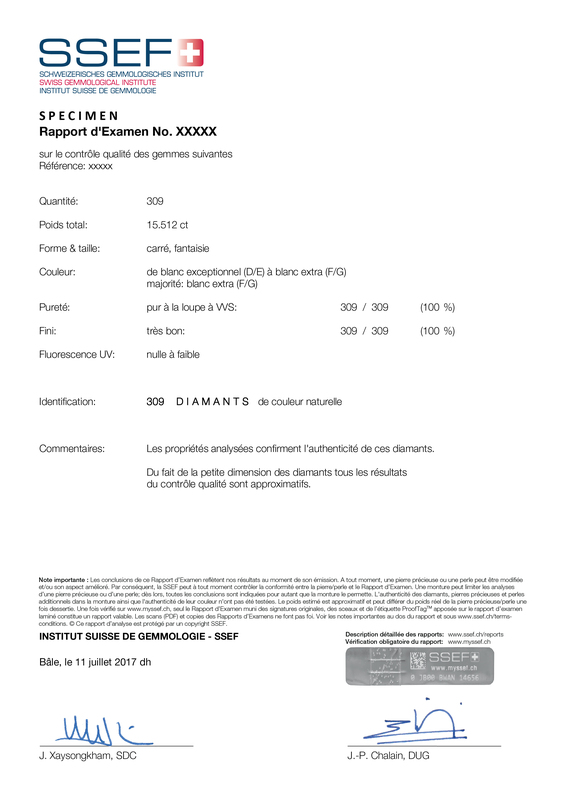 Please also note the terms & conditions for submission for quality control of small diamonds (in French PDF). We routinely control colour, clarity and cut quality of small diamonds. Each diamond that is subject to quality control is also authenticated using the ASDI instrument, with the aim of sorting out any and every synthetic diamond or diamond imitation. Each small diamond is placed table down in a white folded paper under a normalised light. Each small diamond is compared to our CIBJO diamond Masterstones. When checking the colour of a small diamond it is important to compare it to a large diamond masterstone. This reduces colour grading margin errors, as opposed to the comparison with a small diamond masterstone. A sortoscope microscope is used for the clarity control of small diamonds and enables the visual control of a large quantity of small diamonds. The size of an inclusion may be measured with a special eyepiece. Stones may be compared with SSEF clarity master stones. The final purity grade is defined by means of the 10x loupe. SSEF has created a Symmetry Masterset for small diamonds. This Symmetry Masterset groups more than 30 selected diamonds from an ‘Excellent’ to a ‘Poor’ symmetry grade. For evaluating the symmetry grade of a diamond we check : roundness ; eccentric or tilted or wavy tables, truncated or short facets, facets of unequal size, edge displacement ; girdle with unequal thicknesses, etc. SSEF has created a Polish Masterset for small diamonds. It groups more than 8 selected diamonds from «Excellent» to «Poor» polish grade.